What better way to spend Sunday night than prototyping with other creatives?! A little background. I’ve been friends with Gillian, Janelle, Sheridan, and Ebele for a while These ladies represent Blockface Design Studio, 2 Hounds media, Sheribomb.com, and the Positivity Clinic, respectively. What’s one of the many things we have in common? We’re all obsessed with creativity, flow, how to light folks up, get inspired and stay inspired. Being a successful creative means that you are able to mindfully manage those emotional vicissitudes between manic flow bliss and the counterbalancing ebb, which, as we tell our mentees, can also come in the form of wet blanket clients and co-workers. How well you handle the blues and cultivate creative resilience is probably the biggest determinant to creative success. Each of us has our high vibe go-to happiness hacks. 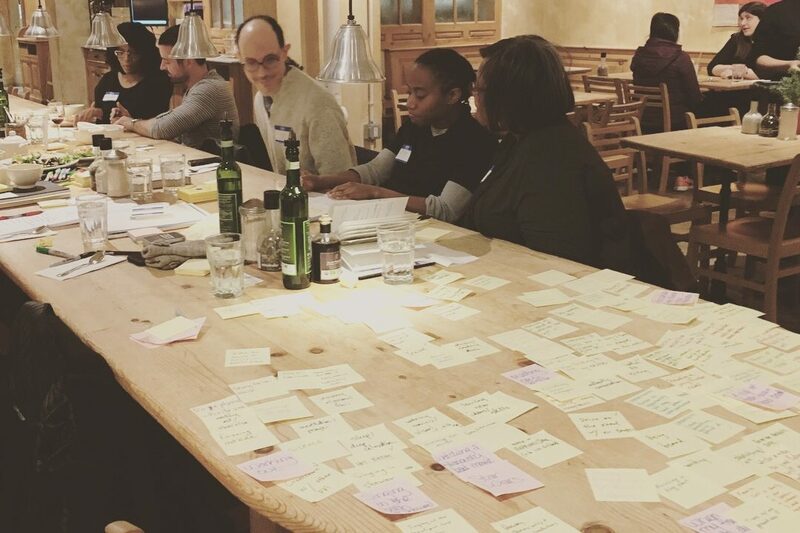 This Sunday we finally got around to doing some community prototyping and ideating. So many great ideas and inspirations. Stay tuned for what emerges! « Be Great. Do B.A.T.T.L.E.